RUSH: Washington, Missouri. Cliff, welcome to the program, sir. Nice to have you with us. CALLER: Hi, Rush. How you doing? Hey, Rush, you know, I’ve been a long-time listener of yours and kind of a student, and I remember back in the nineties when Clinton was president, and the economy was doing good, you said the president does not have anything to do with the economy. You said it’s hard-working people getting out of bed and entrepreneurs that make this country great. But now that a Republican is president, you want to credit everything to the economy to the president. Now, why the 180 turn? 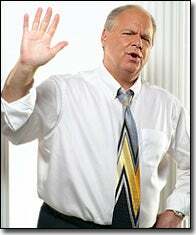 RUSH: Well, as usual, you got some of the opening statement a little incorrect. CALLER: No. That — I listen to you, Rush. They were your exact words. You said the only way the president — president can create any jobs is if he expands government. That’s it. You said otherwise, it’s the people that make this country great, not the president. RUSH: The context is wrong. RUSH: The context was this. Bill Clinton had just imposed massive tax increases on everybody, and on some people they were retroactive. Those tax increases had the possibility of stalling an economy, and were it not for the Republican Congress winning in ’94 and starting work in 1995 and balancing the budget and coming up with welfare reform, and a whole lot of things that the Republican Congress forced on Clinton because he had to work with them. It’s always the American people that make the economy grow. They’re the ones out there engaging in commerce. What I’ve always said is that government can do one of two things: It can get out of the way, or it can get in the way, and Clinton got in the way. The American people overcame Clinton by getting up every day and refusing to sit back and let the tax increases that they had to pay and some of these other things, slow down their economic advancement. Pure and simple. So, as usual, you got what I said right, but you leave out the context. Do you work for Media Matters? CALLER: No. We were running 5% quality growth with surpluses. Now we’re averaging, if we can get 2%, and you want to give credit to the president for that? RUSH: If you want to talk about a surplus, let’s talk about Ronald Reagan ending the Cold War, and creating the Peace Dividend. That surplus was always on paper anyway! The Clinton people put out this story that they had about a $10 billion surplus. It never materialized, because budgets change from year to year. CALLER: Well, Rush, you’re confusing me. RUSH: Well, I’m not surprised. CALLER: You know, you say one thing about when there’s a Democrat president and then when there’s a Republican president and everything, a 180 and you want to give credit, I don’t understand it, being a student of yours. RUSH: I’m trying to tell you again they know. What I’m trying to do is tell you is that there were specific programs implemented by George W. Bush to get rid of the oppressive Clinton tax increases that have led to unbridled economic growth. It has led people into activity that has been profitable for them. The capital gains tax rate was cut to 15% so it’s not onerous to earn profits on stocks. You don’t have to worry about hiding the profit and sheltering it somehow because if the tax rate’s only 15%, I’ll pay that. I’ll pay that if I can get 85% of my gain. I’ll pay it. The Clinton tax rate was much higher so people were using other investment students rather than equities. There’s a reason the stock market here is doubled! It’s an attractive place to be. The economy is doing well, and so, the companies that are traded publicly are growing in value. It all makes total sense, and it’s all related to tax cuts, and this is the great little secret. The Democrats don’t want anybody to know that the tax cuts are the engine of all this so they’re out there trying to make everybody believe that the economy is not that good. My only point was we have a robust economy, and it’s not being reported and I come up with the phrase ‘Bush economic plan’ because it is his plan to roll back taxes. Nothing I have ever said today or any other day should be construed to mean that I think George Bush is hidden somewhere behind a curtain pulling economic levers that are making it all happen. Bush got out of the way. I’m telling you, taxes are such a key to this. They work every time they’re tried. It’s like abstinence and either teen pregnancy or disease. It works every time it’s tried! That’s irrefutable. Well, abstinence work every time it’s tried. Tax cuts work every time they are tried. The states are rolling in money. The federal deficit is at $200 billion, everybody thought by now it was going to be up to $800 billion. I guarantee you, if the deficit were $800 billion, you’d see whining and moaning. ‘The Deficit Monster is back,’ and Bush would be targeted and blamed for incompetent stewardship. Another thing, by the way, about the nineties was that the Democrats and, the Drive-Bys, were going out of their way to give Bill Clinton credit for every infinitesimal thing that happened, which is another reason why I said presidents don’t have that kind of hands-on control over the economy. If they did, there would never be a recession, because it’s always harmful to a president. He always does get the blame. Seldom do they get credit — unless they’re Democrats. RUSH: A couple more things here on the seminar call we had accusing me of blaming Clinton saying he had nothing to do with the economy and now crediting Bush for it. You gotta remember, and I do, the economy was relatively flat until the GOP takeover in ’94. Remember their campaign theme for Clinton was, ‘the worst economy of the last 50 years,’ even though it wasn’t. We were just coming out of a mild little recession, and they called it the worst economy in the last 50 years. We had people calling here, ‘Rush, it can’t get any worse.’ I’m pulling my hair out over the futility of trying to talk to people who had been brainwashed by a typical media barrage, and when they came into office the first thing that happened was they started attacking the pharmaceutical business, and they were trying to sponsor this health care business. That scared the hell out of business. Business was facing Stalinist-type controls over how it was going to be able to manage health care and provide it to employees. The whole thing was a mess, and everybody was…I won’t say panicked, but this had a lot of people paralyzed. They weren’t willing to invest in the growth of their business, ’til they found out how this thing was going to turn out because it was going to have a dramatic impact. So when Hillary Care went south, when it bombed, there was a huge sigh of relief (big sigh) from American business, and then one of the first things that the Republican Congress engineered was a capital gains tax cut in 1995, and that’s what led to the stock market’s resurgence then and the general resurgence of the economy. Clinton reluctantly signed it. He had to go along with it. Remember, he was running around trying to tell people he was still relevant after the loss of Congress. It was a sweeping defeat. Republicans won 56 seats for the first time in 40 years were running the place. Clinton was all bamboozled and dumbfounded. So the Republican Congress had quite a role to play in that. But the American people do make the economy. There’s no question about it, but a president, and the point I was trying to make, can do one of two things: He can stifle the economy. He can stifle the American people with all these taxes and regulations. In this case, President Bush had these new Clinton tax increases that were in playing all through the nineties, income taxes and other silly little regulations that just caused roadblocks and obstacles that people have to work harder to overcome. So President Bush came in and he fought the Democrats, and a bunch of Republicans, too. He had these moderate Republicans out in the Northeast; they’re not for tax cuts, either. But he got ’em, and that created a pro-capitalist environment. Americans are like no other people. Through hard work and ingenuity, they will create jobs and create wealth when the government gets out of the way. Hello Ronald Reagan and the eighties. That’s why there’s so much revisionist history about the eighties and ratings tax cuts, because of the great boost it gave the economy. Democrats can’t stand that. They’ve gotta revise history. They gotta make people think that it was not good, that it led to all kinds of problems, like ‘the worst economy in the last 50 years.’ But if you are a big government liberal, you’re not going to appreciate the hard work and ingenuity and the creativity of the American people. It’s going to threaten you, because you think only government can make things good for people. They can’t do it for themselves, and if they do, they’re cheating and they’re denying somebody else the right to do good, too.